You have heard their melodious voices separately on many a hit Bollywood song but now Shweta and Shraddha Pandit have come together to create beautiful music. For the first time, you will hear the two fabulous singers combining notes on their album titled Sister Act. We caught up with Shweta and Shraddah and they gave us the story, the grooves and the inspiration behind the music and lyrics for their cool colloboration! Check out what they had to say on all things Sister Act! Tell us about your new project Sister Act. 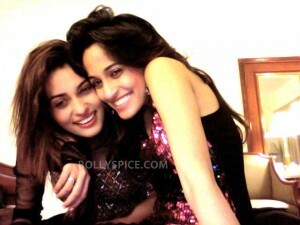 Sister Act is the first time both Shraddha and I will come together and sing our own compositions, which we also wrote. Shraddha and I were very clear from the start of our careers that we wanted our individual identities as singers and go ahead with our solo careers as playback singers in Bollywood. We have had similar music training in Hindustani classical vocals from our grandfather and guru Shri Pandit Pratap Narayan (Elder brother of Shri Pandit Jasraj) and we belong to the Mewati Gharana of classical music. Shraddha’s popular songs include ‘Tujhpe Fida’ (Heroine), ‘Jigar Da Tukda’ (Ladies VS Ricky Bahl), ‘Bipasha’ (Jodi Breakers), ‘Khuda Ke Liye’ (Azaan), ‘Band Bajaa Baraat’ (Title song), ‘Pehli Pehli Bar Baliye’ (Sangharsh), ‘E Shivani’ with Sanjay Dutt (Khoobsurat), ‘Rang Deeni’ (Dev), ‘Genda Phool’ (Delhi 6), ‘Mann Chandre’ (collaboration with AR Rahman for Connections) there are so many of these great songs which people don’t even know she has sung! Shweta is the younger one but we started pretty much at the same time with 5 songs in Mohabbatein, ‘Madhubala/Do Dhaari Talwaar’ (Mere Brother Ki Dulhan) ‘Thug Le’ (Ladies VS Ricky Bahl), all songs from RGV’s Naach, Farewell Trance (Kabhi Alvida Na Kehna), Neal n Nikki songs, ‘You’re my love’ (Partner), ‘Tera Sarapa (Welcome), ‘Chadha De Rang’ (Yamla Pagla Deewana), ‘Jhini Jhini’ (Sarkar Raj) and many more award winning songs in Tamil, Telugu and Panjabi films. I also won my first Filmfare award for best Playback Singer in 2010 (South). In fact we both were also featured as the only sisters to sing different songs in the same film for different actors last year (Ladies VS Ricky Bahl – YRF) where I sang for Anushka Sharma (‘Thug Le’) and Shraddha for Parineeti. When Launchcast and ArtistAloud (independent music) approached us for this concept we both instantly decided that we should do it together rather than solo because most people have never seen us performing and singing together before this. Many of our listeners and admirers told us this through mediums like Twitter and Facebook. SisterAct is special for these reasons as finally WE COME TOGETHER! Shweta what do you love about Shraddha’s voice? Shraddha can experiment a lot with her voice, I feel she is amazing with item songs, a potential still to be tapped by composers, but I think Salim Sulaiman have done that a lot and so has AR Rahman because I love ‘Mann Chandre’. Shraddha also has great Sufi, western and folk element in her voice, something which I sound very different in! I think she is a complete package but I do feel people have taken really long to realize her potential. She’s a firebrand and a great performer on-stage too! She has actually inspired me all my life. Shraddha what do you love about Shweta’s voice? Shweta’s greatest quality is her voice remains the same in lower and higher octaves. It doesn’t change like most female singers I hear today. They use their head-voice and change their voice texture in the same song, which is not ideal in playback singing but today listeners have become very lenient. Most listeners don’t realize this as they are used to hearing the singers now. Shweta’s real potential hasn’t even been taped in Bollywood yet. Her voice hasn’t been studied well here. Many of her songs are hugely popular but I feel a path breaking song is yet to come and is on its way. Her voice can suit any actress on screen. Shweta’s voice is neither shrill nor thin nor is it too fat and male-like. It’s perfectly tailored made for film singing. What went into the creation of the album? Well, writing was the tough part because coming up with words that move your soul isn’t that easy. Shraddha, I believe, is a born and gifted songwriter. In fact she’s written for movies like Azaan (Salim Sulaiman) too. Then of course the orchestration and the arrangements. We wanted to come up with a melodious and contemporary music product for our listeners and fans. SisterAct is just that. Definitely a lot of good melodies, Sufi and folk elements plus also a retro and semi-classical song. There’s a lot of variation in our styles of singing. Our versatility, the fun and dynamics in the songs are the key in the album. Well, composing music is in our blood with Jatin-Lalit being our dad’s younger brothers. Dad, (Shri Mandheer Pandit) himself is a composer but my dad did not do mainstream commercial movies. However, it is so amazing that my uncles were inspired by him; in fact his talent has inspired his and our entire generation. Dad told us we have so many good songs we must record and sing and finally we decided to do it. In fact there are so many more in books and sheets waiting to be heard by listeners. Some of them are masterpieces and if movies and filmmakers don’t pick them, we still want to record them and sing them so people hear the magic. We’ve waited for a good release for over a decade and now it’s truly the right time. Tell us about choosing the songs you wanted to present. We wanted 5 songs different from one another in singing style and in category. Semi classical, western, Sufi, folk, and ballad are the choices we picked. There wasn’t too much over-thinking. We went with the flow and what our hearts decided. ‘Ab Ghar Aaja’: It’s based on Raag Bageshri and Taal Rupak (7 beats) it’s a classical piece and we wanted to do a fusion with it. It’s our presentation of it. It’s special as it has a lot of repeat value in listening; it’s soothing and gives a dimension to Indian classical music. ‘Kaanch Ki Gudiya’: Shraddha’s composition and lyrics. Shraddha wanted to use this in her album but this one didn’t make it and we decided to play it for SisterAct. I loved this song from the moment she played it because it’s so much like Spice Girls and it’s so much fun and catchy! ‘Kehdo Naa’: My very first written and composed track. I wrote this in America. I’ve always wanted to write a mushy, romantic and ‘Pehla Nacha’ kinda melody but I never got the inspiration till I heard this music piece, which was sent by my music arranger Kevin who lives in LA. The piano parts stayed with me and I finally decided to write a melody to it. It was really quite an uplifting experience. The best part was I played it to some of the composers in the South and they actually loved it. That’s my biggest encouragement. On YouTube it’s got 81 likes so far without a single dislike which I think is quite something considering people can be so ruthless on YouTube with comments. Haha.. I am thankful they liked my first effort. ‘Ranjha Ranjha’: My personal favorite in the album. Ranjha is a singer’s dream because it’s a blend of Punjabi folk, Sufi and romance all in one. It’s about the love of Heer Ranjha and I always loved this love story. Shraddha has written this song and I think this song should be in a movie. It is so for the big screen and should be shot on someone like SRK and Madhuri in a YRF movie… it’s actually that beautiful and I mean it, or else I wouldn’t say it at all. ‘Sajna Ve’ (Maahi Ve): Shraddha’s solo. She wrote this again being insider by the Heer Ranjha love story. It’s a pacier folk blend and has a great groove to it. I love the lyrics of the entire album. If you listen carefully they are so deep and so connected with life and love. I think the lyrics of the entire album are one of the biggest highlights and Shraddha is an amazing writer by the way. What is your favorite type of music to sing together? We’ve grown up on Indian classical music so it’s gonna be our favorite. We have similar tastes in music. We also love western and MJ, The Corrs, Mariah Carey, Beyonce, Rihanna, Seal, Imogen Heap and Florence and the Machine are the ones we love. Shweta has even performed on the same stage as India.Arie. Herbie Hancock, Florence and the Machine, Robyn, Kristina Train, Idan Raichel, Barry Manilow, Jamiroquai, Colbie Caillat at the Nobel Peace Concert (Norway) with AR Rahman. I think that’s truly historic and a huge achievement for her age. It’s such a proud feeling to be her big sister. We’ve been going on tour individually since we were 11 but yes, we’d love to do it together from 2013 onwards. I’ve been touring with AR Rahman for 5 years now and also with Yuvan Shankar Raja, Vishal Shekhar, Adnan Sami, and Himesh Reshammiya. While Shraddha has been touring with Salim Sulaiman, Mika Singh, Sajid Wajid among others. Now its time we both tour together and it’s UP next for sure. Tell us about the experience recording this live on Launchcast on the ArtistsAloud series. ArtistAloud and Launchcast have been a great and strong support for independent music. They are currently a boon to non-film music as the market had almost died. I congratulate them on reviving the power of music bands, independent artists and stage performers. A lot of people in the music biz don’t get big breaks in Bollywood but that shouldn’t end their careers. This is a great platform to reach out to the listeners. Who will love this music? We haven’t aimed at a particular age or a group simply because our songs have a universal appeal. Our music caters to all music lovers and our lyrics are poetic. The beats allow the youngsters to perform on these songs too. Do you see future albums together? Of course! SisterAct is the first of many series hopefully. We need everyone’s best wishes and support as always! What do you each think of Hindi film music today? The trends are changing too fast. It shows how impatient listeners are and the kind of lives everyone is leading. No song works more than a few weeks. Even movies are all about the weekend today, earlier they worked for 100 weeks and people would still go to the theaters to watch the same film. So basically there has to be some sort of stillness and real melodies that need to be released in the market and promoted by the real big stars so people know the differences. Shweta is currently working on her first international single ‘I dreamed a dream’, which you will hear her singing in English. It’s gonna be released in the first week of January 2013. Shweta in fact just did her first Christmas video with some of the biggest YOUTUBE stars in America, featuring Mike Tompkins and many more. It’s called “DECK THE HALLS” and she’s the only Indian chosen to be featured on it by them. Shweta’s first film as an actor DAVID releases on Feb. 2013, where you see her on the big screen, her little acting role debut with a massive star cast will also be released in Tamil, Telugu and Hindi and she even sings in the film. 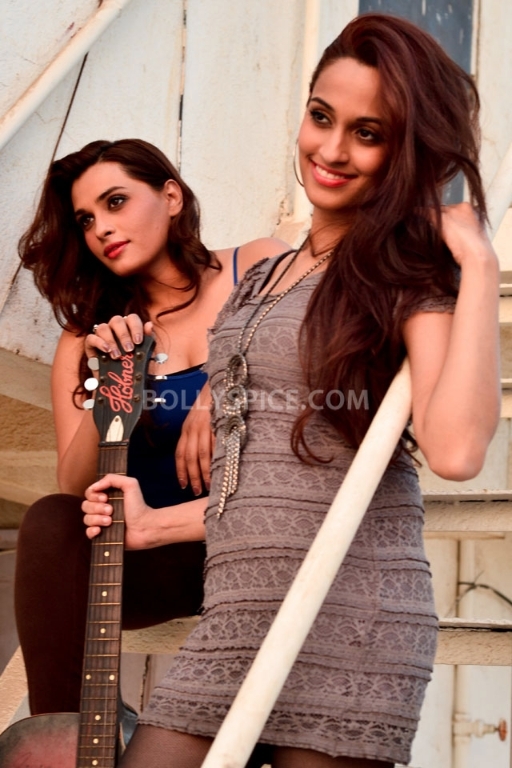 We both are then going to come up with our first music video together from the “SisterAct” series by the Pandit sisters early 2013. Here is a special treat, you can see the album being recorded and hear the song! Check out Sister Act on Launchcast! We can’t wait to hear more from these two both in Bollywood and to their own cool beats!